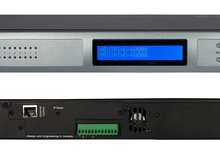 The BSS Soundweb London digital PA processors now features the BLU-50 four-channel unit. BSS Audio introduced IEEE Audio Video Bridging functionality to its Soundweb London family of digital signal processors. Community Professional Loudspeakers announces the debut of its loudspeaker processor, the dSPEC226. The new Digitool digital audio processors from Peavey Architectural Acoustics bring world-class NWare processing and network control to mid-market contractor and live sound reinforcement applications. Architectural Acoustics by Peavey debuts three new models of the venerable Peavey Architectural Acoustics Digitool multiprocessor series. BSS Audio added a break-in box to its Soundweb London family of digital signal processors. The new 1260m, 1261m, 640m and 641m join the 1260, 1261, 640 and 641: The new ZonePRO devices share the same total numbers of inputs and outputs as their equivalent siblings but feature additional mic/line inputs.